I was born and raised in Huntsville, Alabama before attending Auburn University. I played many sports growing up and during high school focused in on Volleyball as my primary sport. I played and trained year round through school and Club volleyball. My coach had a particular passion for high intensity conditioning with lots of plyometrics, sprinting, and weightlifting. I believe this is where my passion for Crossfit like workouts developed. I casually worked out throughout college and played intramural volleyball. At the end of my college career, Brock (my husband, you’ll see him in the 6:30pm class) had gotten a job in Houston so we moved to TX the summer of 2009 with our two blue heelers Roxy and Rascal (my babies!). I spent several more years participating in group exercise classes, teaching boot camp, running, etc. but still felt like I wasn’t getting the most out of my workouts. I discovered CrossFit in January of 2013 and never looked back. I immediately fell in love with the competitive aspect, team-like environment, community, workouts, and the results! We moved to Tyler in October 2015 and quickly found Crossfit Tyler. Some of our first friends made here were through Crossfit. Soon after moving here I got my Crossfit Level 1 certificate. I love all things about Crossfit and particularly love showing people that Crossfit is for everybody! (The workouts are infinitely scalable). 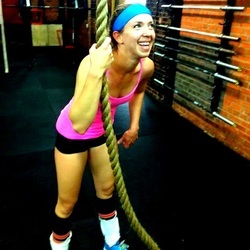 I CrossFit because I love the intensity of the workouts, the competitive aspect, the community. I coach CrossFit because I love seeing people find their new strengths and discovering they’re truly capable of. I love seeing the excitement on people’s faces when they overcome their doubts and fears. You'll catch me smiling when I'm doing Clean & Jerks, Wall Balls, Box Jumps.